INDIANAPOLIS – No, it isn’t what Braxton Alexander wanted. And it sure isn’t what Kyle Hatch wanted. But the simple fact is: Only one kid in each weight class can earn a championship at the IHSAA state wrestling finals. And sometimes you settle for the next best thing. For Hatch, a Warsaw senior, that meant a third place finish in the 152-pound weight class and his only loss of the season Saturday during the 79th annual IHSAA state wrestling finals at Indianapolis. For Alexander, a Wawasee sophomore, it was a sixth place finish at 120 and a desire to come back a year from now and win the thing. A record crowd of 12,456 spectators crowded into Bankers Life Fieldhouse to see Brownsburg – coached by former Mishawaka coach Darrick Snyder – win its first state team title Saturday night. The Bulldogs placed three wrestlers in the finals and rolled up 100 points for the victory. Chesterton was second with 80. “I wouldn’t say I’m not happy with it, because to get third is an accomplishment in itself,” said Hatch, who waxed philosophical after closing his senior campaign with a 50-1 record. The 50 wins was a school record, breaking the old standard of 48 by Justin Brooks. Hatch coasted through his morning quarterfinal, posting a 12-3 major decision over Columbia City’s Hunter Reed to start things off. But in the semifinals, against a nationally-ranked beast named Joe Lee from Evansville Mater Dei, Hatch lost by technical fall, 15-0, with Lee in control from start to finish. The Tiger standout bounced back in the consolation round, rallying from a 4-0 deficit to beat Jimtown’s Kenny Kerrn, 12-7, for third place. Hatch fell behind early after suffering a leg injury, but came back with a fierce third period rally. Hatch and Kerrn are longtime training partners in the off-season. “I have tremendous respect for that kid,” said Hatch, who will be wrestling for Wabash College next year. Hatch, who was eighth at 106 as a freshman and seventh at 120 as a sophomore, set school records for wins and pins in his illustrious career at WCHS. Alexander (42-6) had slightly different view of things after closing his tournament with a 5-2 loss to Elkhart Memorial’s Christian Mejia. “I’m happy with what I did, but not satisfied. I’m never satisfied until I win,” said Alexander. Alexander lost a 12-3 decision to Cayden Rooks of Columbus East – the eventual state champion – in the morning quarterfinals, dropping him into the wrestlebacks. There, the Warrior soph beat Indianapolis Roncalli’s Tyce Freije, 5-4, sending him to the fifth-place consolation match against Northern Lakes Conference foe Mejia. Unlike most wrestlers, Alexander said he wasn’t all that impressed with the state meet. No area wrestlers earned a state championship, but two took home state runner-up awards. Jimtown’s Hunter Watts (48-3) finished second in the 113-pound weight class, while South Bend Washington’s Isaiah McWilliams (49-1) suffered his first loss of the season in the state championship match at 285. McWilliams’ tournament was marred by the ejection of his coach – and father – Tony McWilliams, who was caught illegally videotaping potential opponents in the morning rounds. IHSAA assistant commissioner Robert Faulkens spotted the Washington coach videotaping other heavyweight matches on the floor. Mishawaka freshman Jacob LaPlace (31-13) finished fourth in the 138-pound weight class. 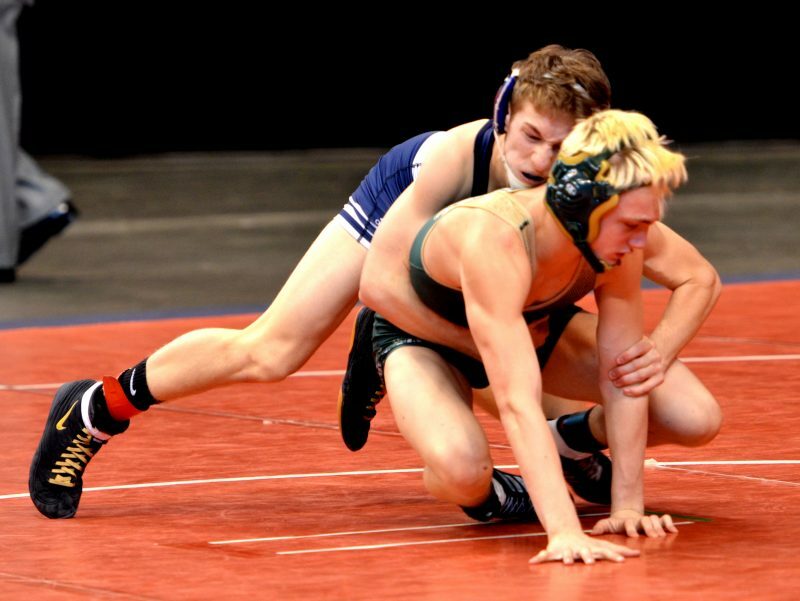 Wawasee sophomore Braxton Alexander placed sixth at the State Finals. TEAM SCORES (Top 20): Brownsburg 100, Chesterton 80, Indianapolis Cathedral 67 ½, Yorktown 67, Portage 54, Hobart 49, Columbus East 47, Monrovia 42, Evansville Mater Dei 40 ½, Perry Meridian 40, Avon 39, Warren Central 32, Lawrenceburg 31, North Montgomery 31, Elkhart Memorial 29, Jimtown 29, Indianapolis Roncalli 25, New Palestine 24, Shenandoah 24, Delta 23. Also … South Bend Washington 19 … Penn 16 … Warsaw 14 … Mishawaka 11 … Plymouth 6, Wawasee 6 … South Bend Riley 4 … Elkhart Central 3. 106: Brayden Curtis (Yorktown) dec. Andrew Black (Shenandoah), 4-3. 113: Alec Viduya (Indianapolis Roncalli) dec. Hunter Watts (Jimtown), 7-4. 120: Cayden Rooks (Columbus East) dec. Ty Mills (Brownsburg), 5-4. 126: Alec White (New Palestine) pinned Blake Mulkey (Brownsburg), 3:32. 132: Breyden Bailey (Indianapolis Cathedral) pinned Christian Hunt (Yorktown), 1:33. 138: Brendan Black (Hobart) maj. dec. Kris Rumph (Portage), 10-2. 145: Brayton Lee (Brownsburg) maj. dec. Jason Crary (Munster), 14-6. 152: Joe Lee (Evansville Mater Dei) maj. dec. Noah Warren (Perry Meridian), 19-5. 160: Brad Laughlin (Yorktown) maj. dec. Diego Lemley (Chesterton), 11-3. 170: Eli Stock (Monrovia) pinned Tanner Webster (North Montgomery), 5:37. 182: Jacob Gray (Delta) dec. Lucas Davison (Chesterton), 3-1. 195: Andrew Davison (Chesterton) pinned Tristen Tonte (Warren Central), 5:59. 220: Mason Parris (Lawrenceburg) pinned Corbin Maddox (Daleville), 2:46. 285: Evan Ellis (Eastern-Greentown) dec. Isaiah McWilliams (SB Washington), 5-0. 106: Brayden Lowery (Perry Meridian) dec. Seth Johnson (North Montgomery), 6-1. 113: Asa Garcia (Avon) dec. Brock Peele (Portage), 5-0. 120: Tylor Triana (Hobart) dec. Colin Poynter (Portage), 6-0. 126: Michael DeLaPena (Merrillville) dec. Graham Rooks (Columbus East), 1-0. 132: Dawson Combest (Columbus East) dec. Kyle Luigs (Evansville Mater Dei), 5-3 in OT. 138: Zach Melloh (Indianapolis Cathedral) dec. Jacob LaPlace (Mishawaka), 3-0. 145: Boone Welliever (Southmont) pinned Elliot Rodgers (Indianapolis Cathedral), 3:28. 152: Kyle Hatch (Warsaw) dec. Kenny Kerrn (Jimtown), 12-7. 160: Alston Bane (Richmond) dec. Gleason Mappes (Center Grove), 3-2. 170: Tristan Goering (Elkhart Memorial) won by forfeit over Zack Fattore (Hobart). 182: Nathan Walton (Brownsburg) dec. Thomas Dull (Terre Haute North), 5-3. 195: Kyle Shaffer (Southport) won by forfeit over Ben Stewart (Indianapolis Cathedral). 220: Gunnar Larson (Avon) dec. Eli Pokorney (Chesterton), 5-2. 285: Robert Samuels (Lawrence North) dec. Rickie Clark (Brownsburg), 12-11. 120: Christian Mejia (Elkhart Memorial) dec. Braxton Alexander (Wawasee), 5-2. 152: Joe Lee (Evansville Mater Dei) tech. fall Kyle Hatch (Warsaw), 15-0 in 4:42. 120: Cayden Rooks (Columbus East) maj. dec. Braxton Alexander (Wawasee), 12-3. 152: KyleHatch (Warsaw) maj. dec. Hunter Reed (Columbia City), 12-3. 120: Braxton Alexander (Wawasee) dec. Tyce Freije (Indianapolis Roncalli), 5-4.